Thank you for visiting the RoohanRealty.com. This website is designed to make it easier and more efficient for Roohan Realty users to interact with us. Like all online resources, we recognize that visitors to this website are concerned about their privacy. 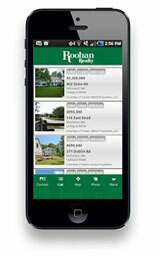 Roohan Realty is committed to preserving your privacy when visiting this website. This information is used to improve this website’s content and to help Roohan Realty understand how people are using this website. This information is collected for statistical analysis, to determine what information is of most and least interest to our visitors, and to identify system performance or problem areas. We do not sell or distribute the information collected from this website to any other organization. If during your visit to this website you send an email to RoohanRealty.com, your email address and the contents of your email will be collected. Personal information is not collected through this website unless you send an email to Roohan Realty.com through this website. If you do not communicate with this website it does not affect your ability to use any other features of this website. Information collected through this website, personal or otherwise, may, if not protected by federal or City law, be subject to disclosure pursuant to law, such as the Freedom of Information Law (FOIL), or court order. Additionally, Roohan Realty may disclose personal information to federal, state, or city law enforcement authorities to enforce its rights against unauthorized access or attempted unauthorized access to RoohanRealty.com information. Roohan Realty limits employee access to personally identifiable information from this website to only those employees who need access to perform a specific job. Security measures have been integrated into the design, implementation, and day-to-day operations of this website as part of our continuing commitment to the security of electronic content as well as the electronic transmission of information. NOTE: The information contained in this policy should not be construed in any way as giving business, legal, or other advice, or warranting as fail proof, the security of information provided via this website. For site security purposes and to ensure that this website remains available to all users, RoohanRealty.com employs software to monitor traffic to identify unauthorized attempts to upload or change information or otherwise cause damage to this website. Information provided on this website is intended to allow the public immediate access to public information. While all attempts are made to provide accurate, current, and reliable information, RoohanRealty.com recognizes the possibility of human and/or mechanical error. Therefore, Roohan Realty, its employees, officers and agencies make no representations as to the accuracy, completeness, currency, or suitability of the information provided by this website, and deny any expressed or implied warranty as to the same.